News: At Helsinki, work has started on building a new Premium Lounge directly adjacent to the Finnair Lounge near Gate 36 in the non-Schengen area. The Premium Lounge, designed by Helsinki-based dSign Vertti Kivi & Co, will be open in spring 2014 and complement the original Finnair Lounge, which has recently been downgraded. The new facility will be available to Finnair Plus Platinum and Gold members and their guests only, as well as frequent flyer cardholders with equivalent oneworld status. It will have a new private shower suites and a Finnish sauna. 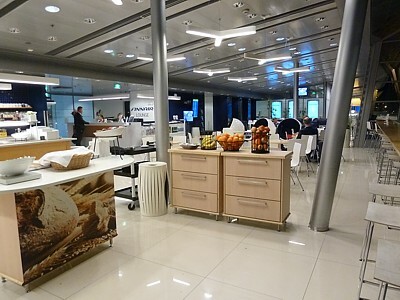 Finnair only has it's own lounge at Helsinki and Stockholm. Finnair Plus Platinum, Gold and Silver members as well as Business Class passengers with the Finnair AY airline code on their ticket can use the Finnair lounges on an international flight, and Platinum, Gold and Silver can use the lounge on a domestic or one class flights. At Amsterdam Finnair uses the Menzies Aviation Executive Lounge (Close to transfer counter T2, second floor, open 0600-2100). Barcelona gets the Iberia Lounge Gaudi (Module 3, to the left after passport and security control). Bejing has the Air China Business Class Lounge (Departure hall, after security control, opposite the tax free shop) where an invitation card is also required for admittance. Cards available at the business check-in. 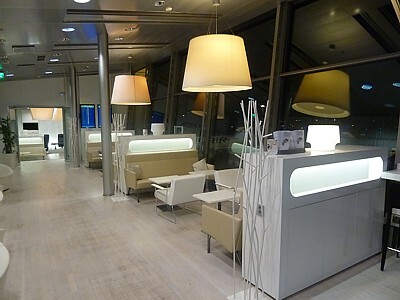 In Berlin Finnair uses the British Airways Terraces Lounge (Terminal 1/B, main hall, Gallery, stairs at gate 15. Open Mon-Fri 0600-2100, Sat & Sun 0630-2130). Copenhagen has the Novia Lounge (Transit hall, first floor, between fingers A and B. Open 0700-2000). Oslo uses the British Airways Terraces Lounge (Main terminal, first floor, west service block, entrance to the left, after security control. Open 0600-2000). Prague has the Crystal Lounge (Airside, 1st floor). In Paris there is the Salon l'Espace (Terminal 2 D, mezzanine floor, stairs opposite of check-in area 8. However there is only access to Business class passengers who are Finnair Plus Silver and Finnair Club members, due to lounge space restriction, and you must get an invitation card at check-in. 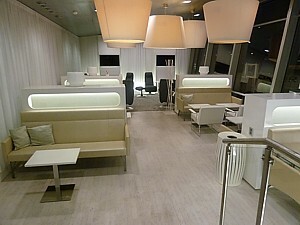 At Bangkok Finnair uses the Qantas Club Lounge. In Singapore there is the Cathay Pacific Business Lounge (Terminal 1, immigration east, escalator to level 3. Open daily 0600-2200) where an invitation card is required for admittance. Cards are available at check-in. New York JFK has the American Airlines Admirals Club Lounge (Terminal 8, 3rd floor). Passengers on flights to the UK have access for Finnair Plus Silver members when departing on BA/AY code-share flights and have AY code on the ticket. London Heathrow has the British Airways Executive Club Lounge. In Birmingham Finnair the British Airways Executive Club Lounge (Departure area opposite door B. Open daily 0530-2100). 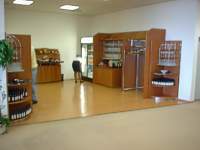 In Edinburgh it uses the British Airways Executive Club Lounge (Airside, between gates 2 and 3. Open daily 0530-2030). Glasgow has the British Airways Executive Club Lounge (Airside, within Shuttle lounge area. Open daily 0515-2030). 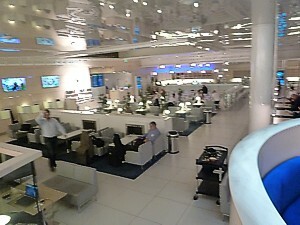 Manchester uses the British Airways Terraces lounge (Terminal 3 Open daily 0500-2000). At the Helsinki hub, Finnair has three lounges (or four, if you include the extra overspill Premium lounge for short haul). 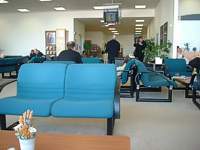 There are however two main lounges, one for flights within the European Schengen zone (domestic, most of the EU), and one for flights outside that area (UK, long-haul). Business Class passengers, Finnair Plus Platinum, Gold and Silver members, Qantas Gold and Platinum, BA Gold & Silver Executive Club, and oneworld Sapphire and Emerald frequent flyers. The Finnair Helsinki Lounge in the Schengen area (used for shorthaul and domestic routes) is a lovely large light bright lounge, the Finnair Helsinki Lounge is a delight, with lots of large comfortable chairs that are design classics in their own right; alas it's let down by the Spartan food and not-that-hot bar. You enter by the dining section, with a small area of buffet seating, and impressive floor to ceiling glass windows, which give a bright, light feeling to the lounge in summer. There is a 'shelf' here, which is actually the best place to dine in the lounge. As you turn left there are the computer pods, and then a rack of low chairs, including three 1960s style egg type chairs. The lounge narrows at this point, and there is another shelf here, designed for working on laptops with high stools facing the window. Next on the left there are a series of low chairs which look achingly trendy, and which are pretty comfortable. Next up in the series of rooms are a series of high backed sofas. This is the most private part of the lounge, and ideal for family groups. Down a short flight of stairs there are more chairs, and then right at the end is the quiet snooze section, with plush carpets and recliner chairs. It's a great place to kip for a few hours (if your 40 minute connection time will allow), or just to unwind. Food isn't great in the Schengen Helsinki Finnair lounge. There is a small buffet area, with a salad bar, soup, bread, and quite a few different cheeses, including a herb cheese spread. However there is nothing really substantial. At breakfast time there is a pile of muffins, plus some biscuits in the jar. At the bar all alcohol is complementary, and there are three beer taps, with Finnish Lapin Kulta beer, Carlsberg, and a Guinness imitation. Wine is poor, with just one cheap white in the ice bucket, and one (new world) red on the counter top. There are just two bottles of Finnish spirits beside the ice bucket. There are three computers in the lounge, in three pods. They are quick and fast, as is the free wifi. There are newspapers on the counter beside the reception desk, and a couple of magazines. There are no showers at this lounge. Priority Pass, Business Class passengers, Finnair Plus Platinum, Gold and Silver members, Qantas Gold and Platinum, BA Gold & Silver Executive Club, and oneworld Sapphire and Emerald frequent flyers. NEWS: Finnair has scrapped pre-flight dining in the longhaul Helsini lounge, however business class meals on these flights are still designed as small/light sleeper meals, with the assumption that you will have eaten before the flight – which is impossible as the lounge offers little food late at night. The novel Finnish spa and sauna have also been recently removed from the lounge. The Non-Schengen Finnair Helsinki lounge is frequently called the long-haul lounge, however it is designed for all non-Schengen destinations (such as the UK plus the US and Asia). 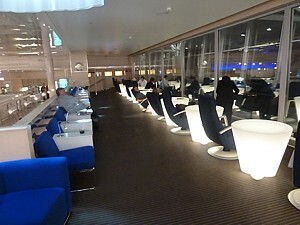 As a result this lounge can be manically busy at around 11pm each night before the Hong Kong and Singapore flights depart. Finnair Helsinki Non-Schengen lounge is a major disappointment. The novel Finnish spa and sauna have been recently removed from the lounge, and there are now no showers. Even the old pre-flight dining is no more. 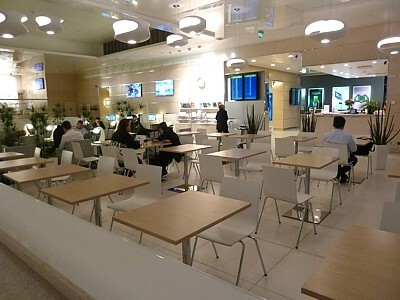 The bulk of the lounge is designed as a dining area, which is right in the middle of the lounge: the whole premise of this lounge was that it was designed for pre-flight dining, allowing you maximum sleeping time on board (and in business class, meals were reduced to small meals). Alas pre-flight dining now ends at 9pm, a good 3 hours before all the Asian flights leave, and on which the meals are still very small. To the left as you walk in is the 'paid' bar and hot meals area (closes 9pm) with three large buffet tables. At the far end of this is an extra spill over dining area). To the right of the entrance are the computers. Upstairs on the balcony, is the best seating, with lots of recliners overlooking the airport apron. Food is the major problem of the lounge - there is little to eat, and what there is, is basic. All day there is salad, which is basically a bowl of lettuce and tomato, with three types of olive oil dressing. At peak times(5pm-8pm) there are also two bowls of chicken and beef. Occasionally there are warm chicken satays. Soup is always there until 9pm. In the evening (9pm onwards) these dishes are left out until they go cold or run out, and not replaced: by 11pm when the lounge really starts to get busy, there is frequently nothing left. The bar also poor, and recent cuts mean that there is little selection. On the worktops there is an ice bucket with one type of white, and a red on the worktop too. 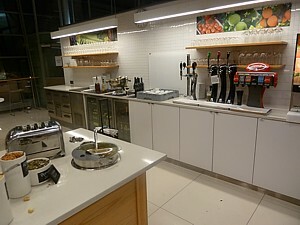 There are three beer taps, with two types of Finnish lager and a darker ale on tap, next to the soft drinks fountain. There is no Sparkling Wine, unless you go to the 'paid' bar (closes 9pm) where there there is Mumm Cordon Rouge for sale. The exception is Joseph Perrier Cuvée Royale Brut Sparkling Wine which is complimentary for Finnair Plus Platinum members, but you have to know to ask - and it is not provided after 9pm. 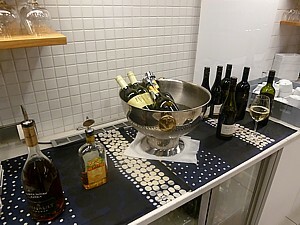 The 'paid' bar also sells spirits, except for Finnair Plus Platinum members who are offered free house spirits. 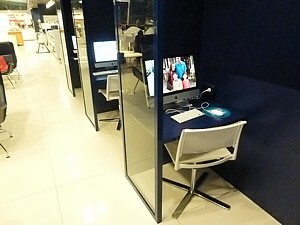 There are three computers in pods close to reception. A few newspapers (not to be removed from the lounge) are on the counter beside the reception desk. Terminal 2, opposite gate 63. Open Mon-Fri 0600-2130, Sat 0600-2030, Sun 0730-2130. This vast lounge is up in the roof of Arlanda. Come out of the lift, and you are greeted by the typically Scandinavia stripped pine floor under a huge arched roof. 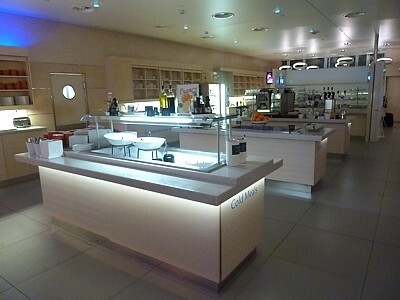 There is also a separate area for Platinum customers, with a better food and wine, and some nice comfy chairs. Airside, 1st floor. Open daily 0600-2200. 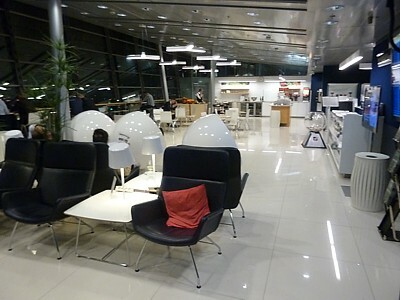 In Prague, Finnair borrow the Czech Airlines CSA lounge. It's at the top of the stairs, and is quite pleasant. Seats are however very hard, and it does resemble a dentists waitting room. There is a good view of the runway. Food is poor, with just a few nibbles, however the bar has lots of drinks - and even has wine in little miniture airline bottles you can sneak out. There is also a vast array of spirits. In the far corner there are two fairly new and fast internet computers, and a printer. All reviews and opinions on Finnair food, service, seats, planes, upgrades, lounges, and the Frequent Flyer scheme are given as a personal opinion. No legal liability is accepted if you take my advice.